Apologies to those far away who are interested in more international stories, but as Matt Thompson says, it’s sure isn’t dull around here — yesterday he locked the farm gates just in time. The administrators came calling again to start removing items. He and they had a Mexican standoff for 2 long hours — he with camera in hand, they in their car. Matt tells me he can’t leave the property. I wrote two letters, and sent the first one below to our politicians and The West Australian, and The Australian. I sent the lower letter to A Current Affair (who have expressed an interest) and also to Senator Cory Bernardi and Dennis Jensen, the Federal Member for Tangney. Both men have rung me in the last few days to talk about the Thompsons. They both give me hope that despite all the self serving pork barrelling and spin, there are still good people — great people — in our Federal Parliament. Senator Bernardi was planning to raise the issue in Parliament last night. I’ve included a third letter from James Doogue (written in July) below mine, because he has taken a different angle with some very valid points and a clear set of actions the state ought to take (and a list of WA parliamentarians). Right now we need someone to stop the administrators. Thanks to James for his help. Please help the Thompsons in Narrogin and intervene to delay the administrators. This below is a book that I hope never gets finished. But it has been started. The Thompson’s followed every rule, broke no law, have no outstanding infringement notices, but the plans and rules kept changing. After they had put their money and hearts on the table the DEC added conditions that no one could meet, dangling them by a thread month after month as the Thompsons complied but the debts piled up. They passed all the tests, have local support, but they are being driven to bankruptcy by the Department of Environment and Conservation of WA. People overseas are shocked at what can happen to honest hardworking entrepreneurs who come to WA. It’s sending a dreadful message of sovereign risk to the world. The receivers are just days away from making this injustice very hard to put right. Federal politicians are standing up for West Australians, but not our state government? In the last week hundreds of thousands of people all over the world have read their story. Hundreds of people have donated and in just a few days $30,000 US dollars has been given to help their children. The word is that tomorrow (Wednesday) one or two federal politicians are meeting with Cameron Clyne, CEO of NAB to try to solve this. Things are dire. The administrators are visiting the house today. A family with four children face eviction and loss of their life savings. Thank you for your immediate urgent attention and help to stop this train wreck. I applaud the way you stood up for WA against the Federal Health take over. But one local family desperately needs you, and they have a growing band of thousands of supporters. The overseas site Watts Up With That gets 100,000 hits a day and has covered this three times in the last week. Matt and Janet Thompson came out in 2001 with money and expertise from the US. The business they set up was so successful they were turning away work in 2007. They’re popular, honest, hardworking but they are now under seige from administrators (they waited at the gates this morning for 2 hours!). The Thompsons and their four children are Australian citizens now, and face eviction in two weeks. They lose everything: years of work and their life savings, their home, their cars, the lot. They have broken no law, there are no outstanding environmental infringements, they’ve done everything the department asked, but the department changed it’s mind, cut their license in half, forcing them to lose money on contract they had already signed for feed and water for the cows they were suddenly not allowed to have. All along, their feedlot was located next to a piggery with thousands of pigs that has operated for 28 years. 900 people signed a petition in their support (that was back in 2007 when they were running with 10,000 cattle). People give Matt $50 notes in the street and tell him to keep fighting. The local shire has written in support urging the DEC to allow them to run the full 14,490 capacity they have works approval for. Barry Carbon who wrote the 1986 EPA legislation chaired a local committee and also supports them and agrees they should have permission to run. Their two closest neighbours want them to stay and increase their cattle holdings up to the original design. 6000 recordings of smells taken in the town show the odours are not unusual or a problem. Most days no one in town can smell anything. We have raised $30,000 around the world in a week to support their children. Many people in the US are appalled at what’s happened to them. They are asking why Australians would do this. This family are being destroyed by a few complainants (with a lot of help from the DEC), all of the complainants moved to a rural area, near to a piggery, but now complain that they don’t like the smell. Some of those who complain even moved in after the Thompsons Beef feedlot was set up. Some of those who complain have also applied to rezone their land so they can subdivide. There are only 21 substantiated complaints. The Thompsons spent a year getting Works Approval from the Department of Environment and Conservation in WA (a year!) to run a feedlot 4.5 km from Narrogin for up to 14,490 cattle. They invested all their money and time, and complied with every request. They gradually built the farm up to 10,000 head, by 2007, and then applied to increase it to near 15,000. But suddenly in March 2008, they were cut back to 6,000, after they had paid to build the farm to carry 15,000, and locked themselves into the contracts for feed and water. They appealed immediately. The appeal for their 2 year license took 14 months. When it came through for them, there was only 9 months left. The banks won’t loan The Thompsons the money on a license that short, and the DEC had written in clauses effectively saying that the farm would lose it’s license if any one person complained about the smell. So if a few people don’t like the Thompsons all they have to do is ring and complain and the farm will be shut down based solely on their opinion and no evidence. We don’t convict people in court based on something so insubstantial. Yet we’ll ruin a family. The Thompsons wanted the DEC to set emissions limits that could be measured. The department refused to. Some other beef farms don’t need licenses in WA — even large ones – they are registered, but not subject to licensing. The Thompsons were told originally they wouldn’t need licenses either. But then the DEC changed it’s mind, and said they’d have to because they were within 100m of a watercourse. You can go to their farm (we have photos I can send you) and film the so-called watercourses and mock the DEC. The watercourses are flat paddocks, with no banks, nor beds, nor flowing water. Even in a 100 year storm any run-off would eventually wash into distant salt pans, threaten no birds, no fish, and cause no algal bloom. This is not about the environment. Is there a vendetta by some green elements of the DEC against the Thompsons ? What has the world come to when people think we can move to farm land and then shut down the farms, even when they are run with world’s best practice measures? This sends a dreadful message to the world. 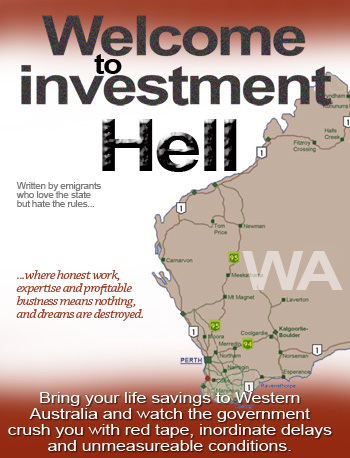 “Don’t invest in WA because the government can’t be trusted to keep their side of the deal”. The Thompsons had an agreement to run a farm of 14,490 cattle, as long as they stuck to the rule book. They did, but the government won’t let them have more than 6000 cattle now, and the banks won’t loan them money to run because they know the license can be withdrawn without warning. I have documented all this on my website. Two federal politicians are taking up the cause in Parliament. I am ashamed of our government and the mental torture it has put these good honest people through. Are we a country run by rule of law where the law applies equally to everyone? The Thompsons are under seige, trapped in their farm for fear the administrators will take things away if they leave their home. No doubt you are aware of the case of Matt and Janet Thompson who have had their lives turned upside down by bureaucratic red tape and obstructionism in trying to develop a successful feed lot business. This project was given the green light and was planned and built on the basis of approvals received. Since then the goal posts have been continuously moves, ostensibly on the basis of environmental concerns and complaints from a small group of people. The feed lot is some 4 kilometres from town and next to a very large piggery, and is in a rural area yet most of the issues which have been raised are related to odours. Any greenhouse gas concerns raised are mischievous because if these cattle are not producing GHG’s at this feed-lot they will produce them else where. Stopping this project from operating will not reduce net GHG’s in this state. At a time when country populations are declining because there are no local jobs, it should be a priority to support long term jobs in country areas. The vast majority of the vocal community support the feed lot. The State Government needs to take up the cause of this business immediately. Firstly suspend any State charges being levied on this business for unused allocations of water. Refund payments for unused water allocations made while the bureaucrats have denied this business to operate at it’s originally approved level of production. Ask the local government to refund rates and other charges paid during this period the Thompson’s have been forced to operate at a loss. Step in and approve the feed lot operation and original specifications and with a long term licence grant to allow these people to earn a living and reduce debt. Consider an ex gratia compensation payment to the Thompson’s for the unnecessary red tape, delays and interference and damage the government bureaucrat have caused. a) A summary of the story. b) All related links and information (including evidence, maps and graphs). c) A review of complaints show activist motivations and how limited the opposition really is. d) Part I and Part 2 of the story in the Thompson’s own words at Youtube. I hope you will do what you can to help this family and a potentially beneficial business. Well, here goes a couple of dozen e-mails. I invite others to do the same. It takes only a few minutes. We can only hope that those in power step in to solve this debacle, even if it’s only through embarrassment. On a personal note, congratulations to you Jo, and to all those that have done their bit by ether donating, writing letters to the media and politicians or just leaving messages of encouragement on this and other sites. Especially all those that have supported from overseas, it seems the world is still full of good people. Matt and Janet, I can only offer my best wishes prayers and moral support, keep up the good fight. Are the administrators just coming by to hassle the family? When are they seizing possession? Why are they around now? Been there done that. The little guy usually loses. Just so everyone knows what to expect. I would offer some money — but they got all mine in a similar fiasco! This story is being relayed world wide through various sites and private e-mails. This will make investment in Australia very hard in the future because too many people are losing their land one way or the other. Bullying bureaucrats and certain groups are hell bent on ruining this once wonderful country which was made on hard work and agricultural industries. Fishermen, Farmers and anyone who is in the primary industries area are being pushed out of their livelihoods every day with rule after rule being introduced by people who have no idea what goes on in the real world. Ask one of them why a farmer would use more fertilise than necessary with the price that it is – one such politician did a day’s work on a farm on Monday and he has a different view already with only one day on that particular subject!!! He had NEVER been on a farm before Monday and yet he is in parliament making decisions that affect farmers. It is about time those who wish to make new rules do not make them retrospective either as this family had everything done legally and now the banks want to strip them of everything they ever owned. If you wish to do something worthwhile to bring the parliament of Australia together, please consider making positive moves to help the Thomspons – Matt and Janet and their four children. I have met Matt and Janet personally and can vouch for their character. 1. Step in and approve the feed lot operation and original specifications and with a long term licence grant to allow these people to earn a living and reduce debt. 2. Consider an ex gratia compensation payment to the Thompson’s for the unnecessary red tape, delays and interference and damage the government bureaucrat have caused. 3. Find out how the DEC are able to capriciously apply the law, and stop them. Matt and Janet Thompson have a factor, often known as the X Factor. They are popular, well spoken and polite. The world is watching and listening. e-mail gone to every MP in WA, they can run but they cannot hide…. Good luck Matt & Janet, we are with you. Hon Nick Goiran MLC is on vacation until October 4th; please contact Jasmine.Piipponen@mp.wa.gov.au instead. Strange situation – the State ALP pollies are voiceless – surely they would make political capital of this to embarass the Liberals – so their silence suggests another game is in play – but what? DEC is more or less controlled by the Greens and the ALP as a result of the Gramscian ploy of taking over the institutions, so it seems that polically we appear to be powerless at this point in time. What common point do the ALP and Liberals share that causes them to be collectively voiceless in this matter? There is somthin goin on and you dont know what it is,,, do you Mr jones. Here’s a clue. Agenda 21. PS. Not a conspiricy, an official plan. You are to bw commended on the research and conclusions you have reached on this matter. I too have researched it at great lengths and am astounded that matters have got this far. I recall working tirelessly on the Peter Soencer affair, but never ran into the roadblocks that have popped up in this matter ad nauseum. Irrespective of talks today, the head of NAB, Cameron Clyne is the only one who can call off the dogs. Maybe an ongoing campaign against NAB is one possibility? eg open multiple online accounts? A white knight is the other. I cannot understand the total reluctance of the print media to give this matter some coverage. At this stage a bit of a splash on ACA would be very helpful IMO. It will embarrass the bank into backing off for now and give the politicians time to assess the situation. Given that there has been minimal feedback to the Thompsons to date and the administrators are at the front door, it is time for more pressure politically. The media and emails are the only way to apply this. BTW you will not get quick responses from correspondence to the pollies (other than a confirmation that the correspondence was received perhaps). Turn around on correspondence is generally 2-3 weeks. This would be expedited if it becomes a contentious issue, but that will only happen if there is a media splash. Hence the first comment. AGENDA 21. Quote. “Joyce Morrison attempts to educate the public regarding the dangers coming to their communities through Sustainable Development and Agenda 21 programs which are designed to gradually take control of all private property through undue regulation”. Please have a look at joyces` site at http://www.newswithviews.com. you can get all the dirt, or should that be halitosos, straight from the horses mouth at http://www.un.org/esa/dsd/agenda21/. Thank you so much for all the in-depth investigative reporting you have done on Matt and Janet’s behalf. Long ago I sent emails to all WA Ministers but the issue was not on their agenda. With all the international exposure that the story has received I hope their attitude has changed. Environmental regulations in all states are ruining farmers and livestock producers and in our efforts to influence government we come up against the vast resources of the WWF and other well heeled environmental organisations. Add to that the fact that we have a lot of weak, ineffective and uninvolved organisations sucking up what dollaars we do have and we have a recipe for disaster. The next generation is not going to take on farming under the present conditions. I sometimes think that it is not only children who think that food just appears on the supermerket shelves. I wish the Thompson Family all the best with this fight and hopefully enough people on side to change this tide. Bully bureaucrats seem all the go these days and if you run foul of them watch out. Somewhere some how there has to be a heart in the government halls and this injustice is corrected. Good hardworking family people like the Thompsons are the backbone of decent and good society. Just so sad that this has happened to them and they are not the only ones to run foul of bullying these days. Good work Joanne, you have been very thorough. Let’s hope it gets out there. Mat and Janet, Had your property been a winery or a mining interest, rest assured ministers would have leapt loops to be of assistance and the media. Working families and farmers although rate and tax payers are a minority in the pecking order. Mr Tuckey was one of few who spoke sense and supported farmers on property rights, maybe now he can comprehend first hand how stalinist these NGO groups have become in WA and overtaken what was a democratic state. Mr Tuckey also stated he would die doing politics, this is a good a place as any to resume your career, fighting for Australian farmers. There is certainly no-one else looking out for there interests , only how to fleece there land of them for little or no cost. This is a massive effort Jo, I hope it pays dividends for Matt, Janet and the children’s sake, but also for Narrogin’s sake. Our new Federal Parliament is supposed to have a new regional Australia focus, but what is the use of getting broadband priority when bureaucrats stymie long term business in regional Australia? From a state perspective, it’s all very well for the National Party, to have won the 25% of mining royalties for regions concession, but regional Australia needs long term viable businesses, not handouts which could be switched off with a change of Government. I have sent this to today. I am unsure as yet if ACA received my article. I post this as a primitive template. Please feel free to use it, modify it or whatever. IT IS A STORY ABOUT MATT & JANET THOMPSON OF NARROGIN WA. Matt & Janet emigrated from USA. In or about 2002 they commenced to set up a beef cattle feedlot in Narrogin WA. It appears from all documentation that they consulted extensively with the local townspeople and the local Shire Council. There was very little adverse comment, and in or about 2003-2004 the feedlot commenced operation at 5000 head and later progresses to 10,000 head. An ultimate capacity of near 15,000 was planned. The feedlot was situated approx 4.5 K from the township of 5,000, and employed over 20 local people. In or about 2007-2008 complaints were forwarded to DEC, the controlling Dept for the Environment in WA about odour. The DEC response was to drastically cut the quota and impose a number of conditionds that made the feedlot an unviable business. On 21st September 2010 NAB put in place a receiver. The Thompsons at all times went through the proper appeal processes with DEC, at great expense, but were unable to emerge with an outcome that was viable. It is highly pertinent to say here that the Thompson enterprise had at all times the full support of a large majority of the townspeople and the local Shire Council, who actually participated in the appeals processes, aligning their position with the Thompsons. I am one of the large group of Thompson supporters based on the Internet. I am appalled by the total lack of coverage given to this tragic story. Fuller versions of this saga may be viewed on Jo Nova websites, or if you wish to contact me I will give you a full resume of people who have better details. It should be emphasised here that the principal complainants in Narrogin consisted of a group of Environmentalists, Narrogin Environmental Action Team (NEAT)and the Local Ag College (Dept of Education). Both were represented at the appeals processes. It is common ground that NEAT receives support from the Environmental Defender’s Office through a tenuous link. This story is in effect a condemnation of abuse of the Environmental laws by Government Departments and other parties wont to flex their muscle. The missing link is Dr. Schoombee who advised them to “APOLOGISE” to the DEC???? And they were advised to consult Dr. Schommbee who heads an organisation that is trying to destroy their feedlot operation? This is the source of the stink the EDO. Start digging folks, it’s been raised in the Senate, and thus in the public domain. Email got kicked back as a closed address. Thanks Anto for a link to Senator Bernardi’s speach — I posted the link on WUWT. Any word on how the meeting is going with NAB? Good for the Daily Telegraph for posting the update!!!
! UPDATE ! : DEC decisions based on only 21 complaints and ignored community support. Your comments are well noted, and perhaps this is an overlooked link. I recall Matt making a similar claim, and at that time I did some research on Schoombee. If you google schoombee and high Court of Australia, you will find a couple of anti logging cases. Kirby and McHugh cut him to pieces. I never really considered him a player after that. I think that may have been an error. I also recall the Thompsons saying EDO taught people to write writs. I have had dealings with EDO in NSW and I have never suspected they were into that game. Again I was wrong as NEAT have litigation form in logging disputes, so someone is writing their briefs, and more to the point, paying their costs. It’s getting to be one of the reasons things have progressed so far. IMHO, events at Narrogin far exceed what the EDO is designed to do. I would like to get more information on WA EDO activities and maybe pass it on to the Law Society. They may have something to say about teaching non lawyers to write writs and claims. As for Schoombee’s charges, I bet he doesn;t get many repeat clients. BTW, he was/is a commissioner of one of the lower WA Courts, so he’s likely to be able to do alot of manipulating behind the scenes. Has the issue been raised with the WA Ombudsman? If the DEC is constantly changing regulations without Parliamentary oversight, then this is a perfect place to start. It meets all the criteria for action by the Ombudsman, so why not try that? I must say that the admiration I have had for the WA Premier has sunk beyond repair over this matter. I would sure like to meet this Environmental Defender. Does anyone know his or her name??? Is it Schoombee himself? FWIW: I’ve sent an email for my local member who also happens to be the Shadow Monster for Mental Health. This relates to his portfolio. For those of you who are writing to individual, elected representatives, you will get closer attention to your letter if you angle it in the direction of their responsibilities. It makes them more important. I have good contacts in the WA Mines Department and a couple of years back on Jennifer Marohasy’s blog one of the AGW crowd pointed me out as part of an anti-agw group in AIG including one of the managers of the Geological Survey of WA. Take it from me that the department has had a fair amount of internal politicking with ALP supporters doing their bit as public servants furthering “The Cause”, along with their parliamentary colleagues. The DEC and EPA, however, are not politically diverse and government funded NGO’s are an extension of that political process, an extension that was initially set up by Maurice Strong last century with his coovert funding of the first Green Groups via the UN; Green NGO’s have proliferated like a cancer ever since. The end game isn’t so much setting up Green Utopia as diminishing private property, and this seems to have been effectively done with the Thompsons; I wonder if this is thus a testcase to test the waters, as it were as a prelude for further DEC machinations to the Green God. But the State Opposition behaving as if they were suddenly afflicted by a disease that affects the vocal chords is too coincidental; Another game is in play, but I can’t identify it for the moment, so one has to wait it out. The test case scenario works best for me. I just cannot contemplate a matter like this having an outcome like this. It’s plain disgraceful.